According to the WHO’s European Health Report, life expectancy for women in Denmark is the lowest among western European countries. Denmark’s life expectancy figures, however, are above the average of 80.3 years for women and 73.1 years for men among the 52 countries included in WHO’s European Region. The European region’s overweight rate of 58.6 percent and obesity rate of 23 percent was behind just the Americas (61 percent overweight, 27 percent obese). As a whole, the European region also had the world’s highest rate of tobacco use at 30 percent. The WHO warned that the region’s “high rate of tobacco use means that it has one of the highest proportions of deaths attributable to tobacco use globally”. Jakarta. Stern opposition continues to mount among government officials and anti-smoking activists against a bid by the House of Representatives to recognize kretek, Indonesia’s clove-flavored cigarettes, as an item of cultural heritage. The move, in amendments being proposed for the 2010 Cultural Heritage Law, would effectively make it harder for the government to impose restrictions on kretek sales and advertising, and in fact oblige the state to support the manufacture and promotion of the cancer sticks. The Health Ministry has also spoken out against the move, saying it threatens to undermine the government’s ongoing efforts to educate the Indonesian public – a population where three-fifths of adult males smoke – about the dangers of smoking. “By being including in the bill, kretek would no longer be considered dangerous [to health],” said Lily Sulityowati, the ministry’s director of non-communicable diseases. Kartono told the Jakarta Globe on Wednesday that promoting kretek would encourage and justify smoking among minors across the country. “Passing the bill is similar to poisoning the next generations,” he said. One in three Indonesian youths aged 13 to 15 smokes regularly, with half of them addicted to nicotine, according to the 2014 Global Tobacco Adult Survey. “Another risk to this plan is that kretek will get special treatment in sales and advertising,” Kartono said. He added he suspected the newly announced proposal was an attempt to head off a possible tobacco excise hike. Indonesia already has among the lowest cigarette prices in the world, with the excise accounting for 46 percent of the total price of a pack of smokes – far less than the level of 70 percent recommended by the World Health Organization. “There may be some wheeling and dealing going on between legislators and cigarette producers,” Kartono said. The timing of the House’s proposal has raised more than a few eyebrows, coming just as the cigarette producers’ association, or Gappri railed against a government proposal to raise the tobacco excise. The group claimed on Tuesday that producers had been forced to lay off 15,000 workers this year as demand weakens, and that any increase in prices would lead to further job losses. Vice President Jusuf Kalla has also expressed his disapproval of the promotion of kretek in the draft, but said he was confident it would not make it through to the final legislation. “It’s just a draft that will be discussed at the House. Of course kretek shouldn’t be included,” he told reporters at his office on Tuesday. Kartono argued that leaving kretek off the list of cultural heritage would not have any negative impacts on clove farmers or the tobacco industry as a whole. “Smoking kretek is only a habit – a very bad one – not a culture,” he said. The review, led by Joseph R. Guydish, PhD, a UC San Francisco professor of medicine and health policy, was published on Tuesday, Sept. 22, 2015 in the journal Addiction. LONDON – Europe has the world’s highest rates of drinking and smoking, and more than half its people are too fat, putting them at high risk of heart disease, cancer and other deadly illnesses, health officials warned on Wednesday. In a report on health in its European region, the WHO said that while many countries had reduced risk factors for premature death, rates of obesity, tobacco use and alcohol consumption “remain alarmingly high”. “Europeans drink and smoke more than anyone else. We are world champions – and it’s not a good record,” said Claudia Stein, WHO Europe’s head of information, evidence, research and innovation. She said this could have the most serious impact on young people, since their lives may be shortened unless something is done to reduce consumption of tobacco, alcohol and kilojoules. Just under 60 percent of people in the WHO’s European region are either overweight or obese, and 30 percent use tobacco. Some 11 litres of pure alcohol is drunk per person per year. The report found that for now, life expectancy is increasing across Europe and the region is on track for reducing premature mortality by 1.5 percent a year until 2020. This means that the number of people whose lives are cut short by cardiovascular diseases, cancer, diabetes and chronic respiratory diseases is steadily declining, it said. Since the last European health report in 2012, substantial improvements have also been seen in rates of death from external causes, such as road traffic accidents and suicides, it found. Zsuzsanna Jakab, WHO’s European regional director, applauded the improvements in health and the steady gains in life expectancy but added a warning. “There is a very real risk that these gains will be lost if smoking and alcohol consumption continue at the current rate,” she said. The report also looked at vaccination rates and found generally good levels of coverage. Average measles immunisation coverage rose from 93.4 percent in 2010, to 93.7 percent in 2011 and 94.6 percent in 2012 and is steadily increasing. However, gaps in immunity “still account for ongoing endemic transmission and have led to a number of outbreaks of measles and rubella in recent years”, the report said. This year, four deaths from measles have been reported in the region, and one child has died of diphtheria – the first case in three decades. British American Tobacco (BAT) yesterday signed a conditional agreement to buy ecigarette manufacturer CHIC for an undisclosed sum. BAT hopes to extend its reach through Europe and expand beyond its tobacco cigarettes to make the most of the growing ecigarette movement – which are widely viewed as a healthier option. CHIC, Poland’s e-cigarette market-leader, makes brands including Volish and has an e-liquids production plant as well as research and development labs. The proposed acquisition is subject to approval from the Polish anti-trust authority. BAT also announced it has signed a vapour products research and technology-sharing deal with R.J. Reynolds Tobacco. Vapour technologies provide nicotine via aerosols in products. The alliance provides a framework for mutual cross-licensing of vapour product technologies up to 31 December 2022. The collaboration also includes joint R&D projects. Investors were less convinced by the move, and BAT shares closed down 2.8 per cent, a five-day low. The medium-term outlook for British American Tobacco is “strong” but the firm is facing earnings downgrades from analysts related to movements in foreign exchange markets and price roll-backs in Australia, one large broker said to clients after the company’s Investor Day. Nonetheless, innovation is allowing the company to grow market share. At its investor day the firm presented two new-to-world innovations, a hybrid device combining actual tobacco and e-cigarettes to improve taste and a new heat-not-burn product. Both were expected to launch in 2016. Those product innovations were also getting to market at an accelerated pace, as shown by the introduction of its “Tubes” across 27bn sticks, representing approximately 4% of global volumes in 2014. The firm was also beginning to mix its innovations. “Although “innovation” is an old story at BAT, we believe that BAT has significantly upped its game, and in future it should be able to roll out new ideas even faster,” the analyst team led by Adam Spielman said in a research note sent to clients. Nonetheless, price hikes Down Under were impossible to carry out in September and profits in South Africa were on the slide, the analysts at Citi added. The weakening Brazilian real and other currencies also meant the total FX ‘hit’ for the fiscal year 2015 was now seen rising to 16% versus prior guidance for 15%. Dr. Albert Siu, chair of the USPSTF told Time. “It’s certainly not a statement endorsing them. There simply are not [enough] studies out there.” A better means of quitting than e-cigarettes: Good old fashioned one-on-one help, counseling and self-help methods. Plus, you’ll look cooler lashing out at your friends and family from withdrawal stress than puffing on a glowing piece of plastic. Given that there are more unknowns about e-cigarettes at this point than there are known benefits, Siu says the committee could not make any determination about whether they should be part of a smoking cessation program. Smoking in numbers: Do e-cigarettes help Scots quit? 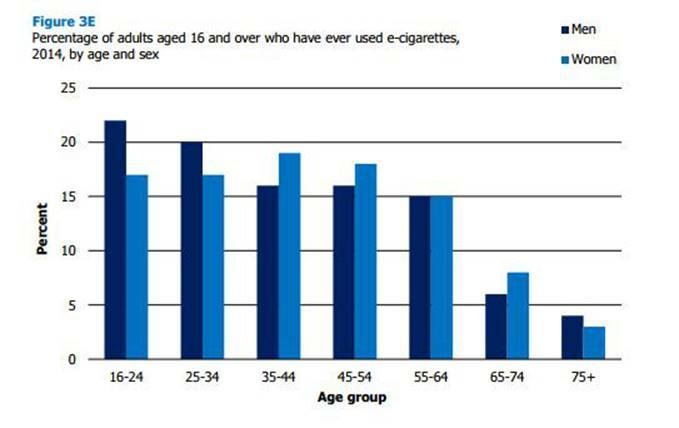 RESULTS from the annual Scottish Health Survey found that 1 in 20 Scots now use electric cigarettes. The figures, which were published yesterday, found 5 per cent of Scottish adults regularly use e-cigarettes, with triple that number having tried them. The annual survey, for which nearly 4,700 adults in Scotland were interviewed, gives a snapshot of the nation’s health as well as the smoking habits of Scots. One in five (22 percent) of those over 16 in Scotland now define themselves as smokers, a proportion similar to 2013 levels. their most recent attempt to quit, 64 per cent of recent ex-smokers and current smokers say they’d used nicotine replacement therapy (NRT) or e-cigarettes. The most common items used during their recent quit attempts were nicotine patches (36 per cent) and e-cigarettes (32 per cent). Research Director at ScotCen Social Research Diarmid Campbell-Jack said: “These findings confirm that e-cigarettes are being used by a small, but not insignificant proportion of people in Scotland with one in every twenty saying that they currently use electric cigarettes. Commisioned by the Scottish government the health report, has been running annually for 20 years. The study also found evidence to suggest that smokers from the most deprived areas are more than twice as likely to smoke compared to those from the least deprived. Maureen Watt, Scottish Government Minister for Public Health, said: “This survey gives us some useful information about what the situation is in Scotland. The use of e-cigarettes as a potential coping mechanism by smokers attempting to quit has been noted by some health campaigners. Sheila Duffy, Chief Executive of health charity Action on Smoking and Health (ASH) Scotland said: “It’s encouraging that the majority of adults who smoke in Scotland want to quit and for some, e-cigarettes seem to be an acceptable alternative to smoking, or a way of quitting cigarettes. Scotland has a vision for putting cigarettes – the most lethal and addictive consumer product on open sale – out of sight, out of mind and out of fashion for the next generation. “There are still many unknowns about e-cigarettes but what we do know suggests that lit, smoked tobacco is a lot more harmful to health. Even low levels of smoking are dangerous, and I’d encourage people using both cigarettes and e-cigarettes to drop tobacco as soon as possible.